The Malindza Refugee Reception Center pre-school has become a medium for children of asylum seekers and refugees to learn the local languages and culture as they interact with local children. This platform enables children to adapt with ease at primary school, having made friends with Swazi children and learnt to communicate in English instead of French and their native African languages. The children are able to assimilate subjects taught at school. The pre-school programme has seen even children from the local community developing a welcoming attitude to non-nationals, shedding off hostility and discrimination. 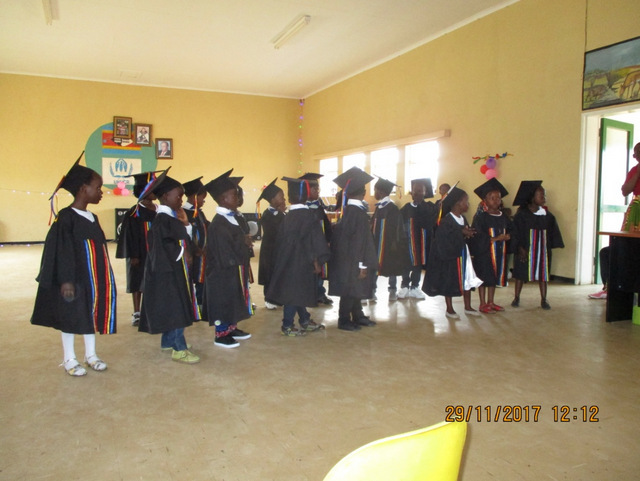 In 2017 the pre-school held its graduation ceremony for 17 children, on the 30 November 2017 at the MRC hall. The eventful occasion was graced by the presence of Mrs Mahlalela, the ECCDE Inspector from the Lubombo region, who represented the Ministry of Education. 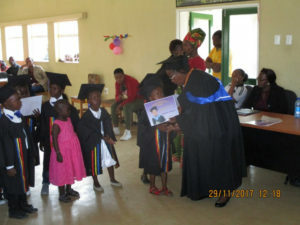 There were performances by the pre-school children exhibiting what they had been learning throughout the year, through song, poems, rhymes and cultural dances. There was presentation of excellence awards to graduates who stood out in various areas during their learning journey and programme completion certificates.